If this is your first time travelling with kids, you’re in for a treat. Jokes aside, it needs a lot of planning ahead. Travelling itself is already tricky, and kids are super tricky, so, you know, do the math. In order to make sure everything goes in order, just follow this packing checklist and you’ll be good. At least in that area. This is the number one for a reason, and that reason is that many people tend to neglect the importance of being prepared for any situation. And this is even more important now that you are bringing your little ones. First, evaluate the needs according to your trip. If you are, let’s say, taking a road trip to major cities across your country, then chances are you won’t need to pack much into your med kit because you will have quick access to doctors and pharmacies. 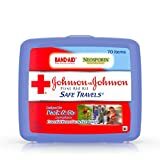 However, if you are heading to some remote wilds in Australia or Central Asia for example, then you might want to bring along a mini pharmacy with you and carry it all the time. The basic med kit contains 5 items: pain pills for random headaches or hangovers, stomach meds, band aids, birth control and vitamins. However, when travelling with kids, that just won’t be enough. 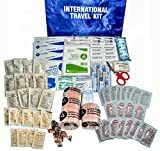 Make sure you stock up on anti-diarrhea meds, anti-itch creams if you are visiting a mosquito prone destination, Cipro, Probiotics (but ones that don’t require being refrigerated), antibacterial gel, motion sickness tablets, necessities for wound cleaning (alcohol, iodine swabs, gauze and medical tape), flu meds, safety pins and scissors. When it comes to the packaging, always go with tablets over creams, liquids and gels. Choose flat-packed tablets or sachets rather than tubes and bottles because you will save a lot more space. You can even ask your doctor for a sample-size product. Also, you can flatten the boxes with the help of rubber bands and use the empty space in bottles to store items that are individually wrapped. Moreover, a good idea would be to visit your doctor before taking your big trip. If you want to avoid airport vending machines or making stops at every gas station along the road, make sure you pack plenty of snacks. Dried fruit, crackers, cheese and olives can be packed in plastic containers, and if you are flying with a baby, note that you are allowed to bring breast milk or infant formula, as well as juice in quantity greater than 3 oz. if you let the security officer know you have that with you. 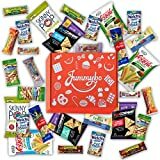 When it comes to snacks themselves, the best snacks to go with when travelling with kids are granola bars, cereal, almond butter, mini waffles or pancakes, fresh fruit, applesauce, dried fruit, popcorn, frozen yoghurt and raw vegetables. In this case, bigger is definitely not better. Unless you have an infant, the best option to go with is a collapsible umbrella stroller. They fold and unfold quickly and take the smallest amount of space. Even preschoolers will agree that this is a good idea once you bring them to a long excursion through the zoo or the park. You are well aware of the fact that both infants and toddlers need to go through more than one clothing change per day. And to minimize the amount of clothing you’ll need, bring garments that coordinate with several outfits. For example, a blue T-shirt can be paired with black, grey or denim pants. So, in other words, you won’t be needing to change the entire outfit because the pants got soiled. If you are flying, opt for slip-on shoes so you will minimize the time it takes to take them off and put them back on. Also, wherever you go, bring swimwear. It takes zero space, and you never know when a pool might appear. You can find quality two-piece girls’ swimwear online, if your little princess had outgrown hers. And don’t bring diapers if you are travelling to a place where you can easily buy them. Your children will be in a new environment, where everything is interesting and different. However, a good idea is to pack just a couple of their favourite toys and some entertaining items such as drawing toys, crayons, a portable DVD player with cartoons, etc. Finally, once everything is packed, put a couple of small zipper-top bags in your luggage, as well as some plastic grocery bags. This will come in handy for storing dirty clothing as well as for gathering smaller items like crayons and snacks. Oh, and wet wipes are also something you won’t survive without. Have a great trip, bon voyage!